Updated to add that a week after I posted this, Sir Nicholas Winton died, aged 106. I join many in thanking him for saving innocent children’s lives in the 1930s. 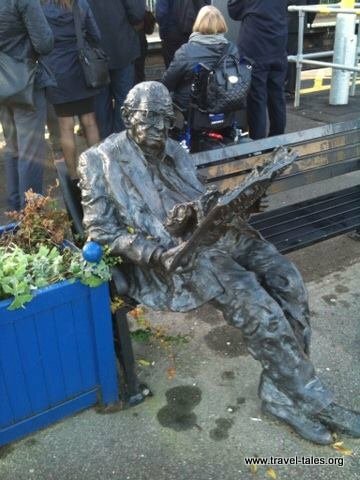 I could have put these into the last two posts, however wanted to talk a little about Sir Nicholas Winton who is commemorated at Maidenhead station with this bronze statue. He is a British humanitarian who organized the rescue of 669 children from Nazi-occupied Czechoslovakia on the eve of the Second World War, in an operation later known as the Czech Kindertransport. Winton found homes for the children and arranged for their safe passage to Britain. He has received a number of honours in the UK and the Czech Republic; in addition to this bronze statue there is one at Prague Station remembering his work with the children as they left their homes and at Liverpool Street Station in London where they arrived. His involvement in this work only became publicly known after his wife found his scrapbook detailing the children who travelled to England and their new homes. At Paddington Station, there is a statue of the previously mentioned Isambard Kingdom Brunel on platform 8 taking in the splendour of the station and the railway. And the most important of all bronzes of is Paddington Bear – the fictional children’s book character who takes his name from the station at which he was found by the Brown family. He recently moved from his previous spot in the ‘garden’ to his current home which better reflects the story.